Functional foods are foods that have health benefits beyond providing basic nutrition. They have been researched and found to specifically influence health and reduce the risk of disease. Some people may call them superfoods, but there are many unsuspecting foods not labelled as 'super' which are also very beneficial and in fact very functional. A well-known example is the humble oat. Oats contain soluble fibre and beta-glucan which has been shown to successfully reduce cholesterol levels and therefor reduce the risk for heart disease. How are functional foods relevant in cancer? Research suggests that nutrition and foods are related to about 30% of all the cancers cases worldwide. Two key factors in carcinogenesis are oxidation and inflammation. These are normal processes of metabolism, and in small amounts are protective and part of the body's immune response. In the right conditions and with the assistance of the correct fuel (ie nutrients), the body can manage these processes in a way that does not lead to disease and instead returns the body to homeostasis. However, elevated levels of oxidative stress and inflammation are problematic and have a significant impact on disease. Modern lifestyle and diet (eg excess sugar, dairy, refined grains, saturated fats, artificial ingredients), stress and exposure to toxins and pollution are throwing out the balance and putting a much higher and chronic load on the body and immune system. When combined with a relative lack of plant-foods, exercise, exposure to sunlight and fresh air, this results in significant imbalance or dysregulation, and contributes to many of the common 'lifestyle diseases' including various types of cancer. This has a huge impact both on the global cost of healthcare and also on the individual. It means that we CAN influence cancer genesis, development and progression, and that some power is back in YOUR hands. It means that diet and lifestyle DO play an important role in cancer prevention, progression and management. Which foods specifically are functional foods for cancer? Dark green leafy and yellow vegetables such as silverbeet, kale, spinach, squash and yellow capsicum contain lutein, which can interfere with cancer cell cycle progression and inhibits cancer cell growth. Tomatoes, watermelon, guava, apricots and peaches contain lycopene which also inhibits the cell growth of various cancers. Orange fruits such as peaches, apricots and oranges have anti-inflammatory and anti-cancer effects. Cruciferous veggies such as broccoli, cauliflower and kale support detoxification processes and lower the risk of various cancers including breast, liver and bowel cancers. Apples, onion, grapes, tea and berries are rich in flavonoids, which are useful in preventing and treating various types of cancers. Blackberries and bilberries specifically contain anthocyanins which suppress the activation of NF-kB, a powerful inflammatory driver of cancer growth. Legumes such as lentils contain squalene, which is protective against colorectal cancer development by reducing the incidence of polyp growth. Fish and fish oil are anti-inflammatory and reduce the risk of breast and prostate cancer. What's the theme here?... Eat a rainbow every day! Interestingly (but not surprisingly), most of these foods are of plant origin, and all of them are unprocessed and natural. Really our diet should consist MOSTLY of these foods, and that in combination with a more active lifestyle, fewer toxins and less stress. This is the key message we tell patients, eating a diet rich in colour and variety, and as unrefined possible. This is what nature intended and is the best recipe for disease reduction. Now of course this is not saying that we can naturally cure cancer through diet and lifestyle alone, but it does suggest that these factors have a significant impact on cancer development and progression. 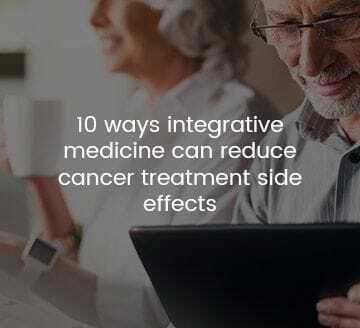 Nutritional medicine should be part of an Integrative Cancer care approach, and our Naturopaths can help you with exactly that.